There’s something immensely pleasurable about the soothing rhythm of long distance train travel. Despite the cosy quarters and extended confinement, I’m happily lured onboard at the first opportunity. The steady rocking motion is how I imagine it must feel for a baby in a pram, mother at the helm, gently cajoling an infant to sleep. Perhaps it has more to do with the fact that long distance rail journeys implore me to slow down and relax. After all, once the train leaves the station there’s nowhere else to go. Confined to carriages little wider than the average family sedan, for some though the lack of room can make them feel slightly claustrophobic. If you’re lucky enough to be travelling with someone special, the teeny cabins make a romantically intimate enclave just perfect for two. For me however long distanc e rail travel is the perfect antidote to a busy life with too little time to stop and smell the roses. An opportunity to unwind and really relax. 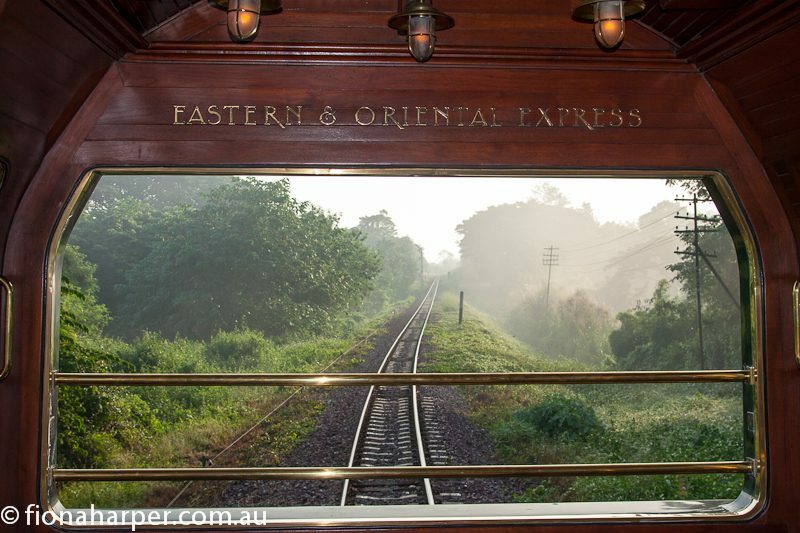 Though, on the Eastern & Oriental Express, it’s more a case of smelling the richly pungent tropical aromas of the Malay Peninsula that waft onboard. 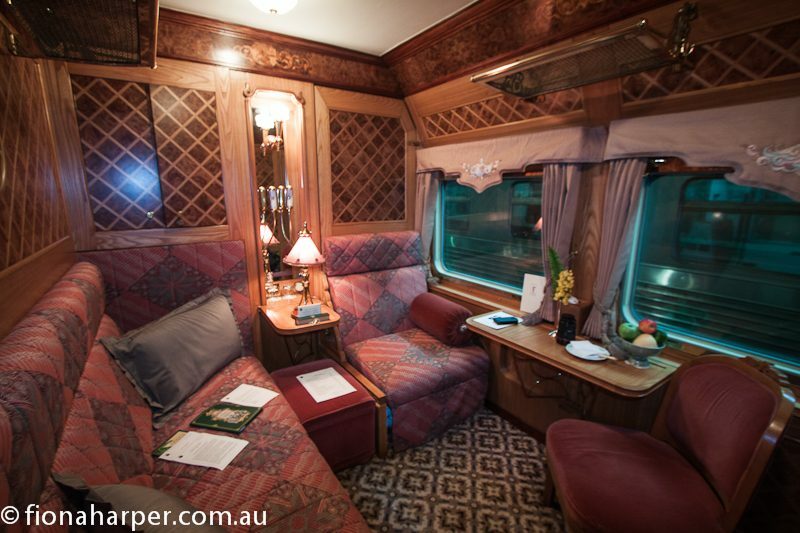 The opulent E&OE has been plying the 2030km route between Bangkok and Singapore for 30 years. Sure, you could fly between the two cities in a couple of hours. But that would defeat the whole purpose of taking a leisurely 3 or 4 day journey. 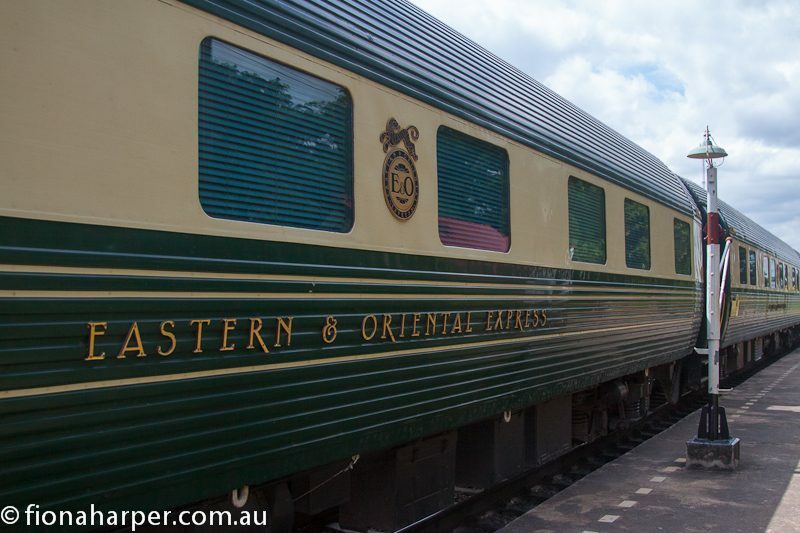 Stepping onboard E&OE is pure travel indulgence: travelling for the sake of travel. 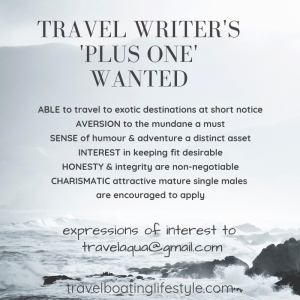 I’ve hpped onboard for the 7 day Epic Thailand journey which takes us east and north of Bangkok, stopping at villages that are well off the regular tourist trail. We’re fortunate to be able to visit the eastern region which has little tourism infrastructure, making train travel the perfect alternative. Regressing to a more languid era before we started rushing hither and thither, needing to be connected 24 hours a day, boarding the E&OE is a little like stepping centre stage into an Agatha Christie novel. Indeed, the grand old dame of the murder mystery once said, “trains are wonderful… to travel by train is to see nature and human beings, towns… and rivers, in fact, to see life.” I couldn’t agree more. Rail lines seem to take a far more interesting route through towns and cities than roads do. From an elevated carriage, panoramic windows allow travellers to peek into back yards of houses, shops and factories, gleaning a voyeuristic view of how the locals really live and play. Inspired by the Orient of the colonial era, onboard it’s all Chinese and Thai lacquer, Malaysian motifs with engraved mirrors and Thai wall carvings. The observation car at the rear is the perfect spot for imbibing in a Singapore Sling after waking from an afternoon siesta. Sounds decadent? Why, yes it is. With its colonial veranda ambience complete with teak floor, panelled walls and rattan seating it’s also rather civilised. Part of the car is open sided, allowing the heady tropical fragrances to drift onboard. It’s also the place to be when chugging through the cities of Bangkok and Singapore if you want to absorb the bustling sounds of city life. Bangkok particularly, can be overwhelmingly loud. Smokers can be found out here too as it’s the only section that allows them to indulge their habit. 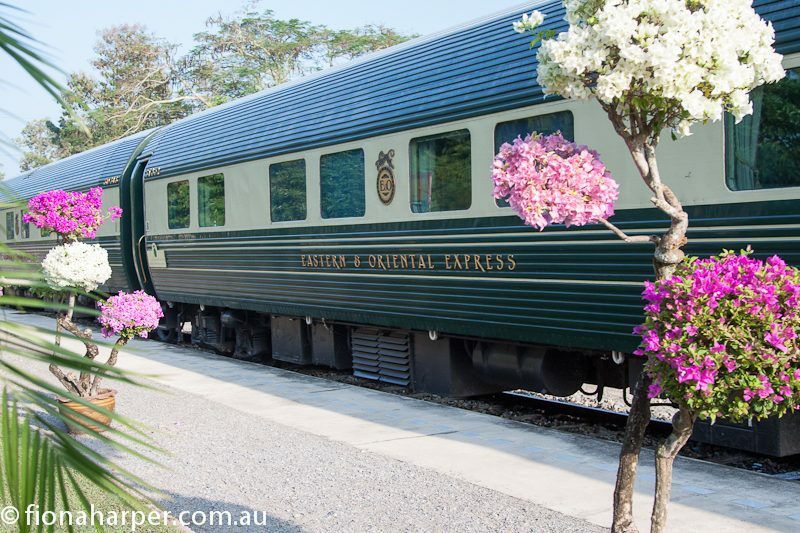 Pulling into stations along the way, there is plenty of time to detrain (to use the onboard lingo) and ex plore places such as Penang’s historic Georgetown and the Bridge over the River Kwai. Onboard historians are on hand for travellers to brush up on the history of the area. Fascinating as these stops are, most passengers are happy to retreat to air conditioned comfort back onboard the train. Gazing endlessly at the passing landscape as it morphs from city to jungle to village to mountains to coast occupies an inordinate amount of time. Meditative, monotonous almost despite ever-changing, it’s almost mandatory to doze off for a mid afternoon siesta, gently rocked into a deep brief slumber. As was the custom in the colonial era. 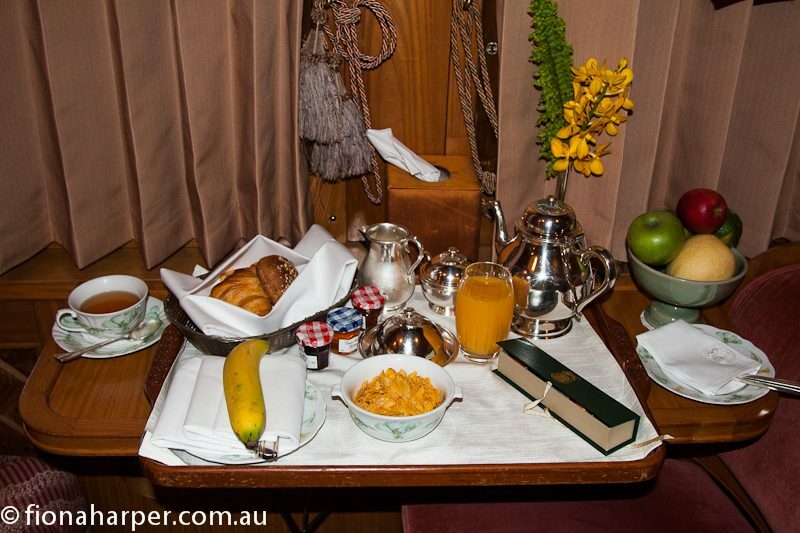 With a sumptous breakfast delivered each morning to my cabin I’m tempted to linger a little longer, coming up plenty of reasons to stay in bed just because I can. Yes, a train journey is just the ticket for a relaxing getaway on the rails.